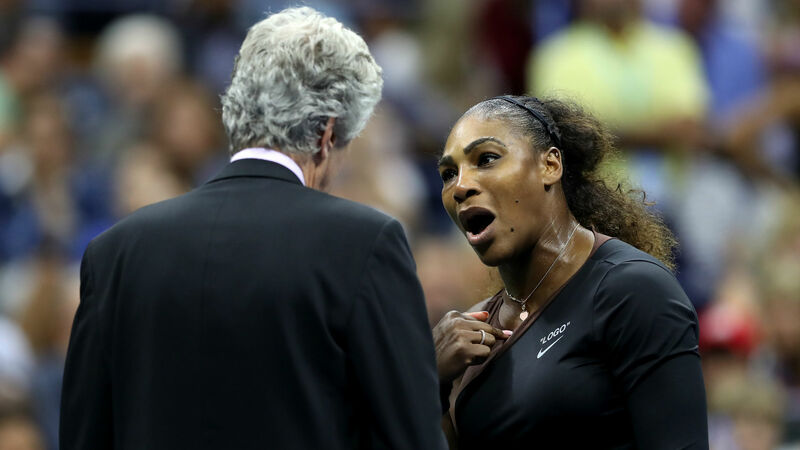 The controversial series of events started when umpire Carlos Ramos gave Williams a code violation warning after he spotted her coach, who was in the stands, giving her hand signals. Williams was fined $17,000 in total: $10,000 for verbal abuse, $4,000 for the coaching violation, and $3,000 for racket abuse. "She said, like, she was proud of me and that I should know that the crowd weren't booing at me", Osaka told The Ellen DeGeneres Show. Williams was docked a game Saturday and went on to lose the championship to Japan's Naomi Osaka. The baseball Hall of Famer confronted plenty of ugliness as he was pursuing Major League Baseball's home run record in the 1970s, and in an interview with Forbes, he said the criticism Williams has faced - including an Australian newspaper cartoon decried as racist - bears echoes of his own past. The third and final penalty came as Williams continued to castigate the umpire, saying, "You stole a point from me". A group of umpires are reportedly considering boycott action against Serena Williams, according to an anonymous source in The Times. Nissan announced the deal at its global headquarters in Yokohama, Japan, marking one of Osaka's first appearances in Japan since winning the U.S. Open on September 8, Nissan said in a statement. Osaka wins both times - showing that she was perhaps always destined to be a champion. "I've seen a lot of people get called for coaching before, and you might have a grumble and stuff, but you get on with it". Speaking to Tribuna Expresso earlier this week in his native country, Ramos indicated he was at peace with his decisions because he didn't pick and choose when to apply the rule book. "It's an unhappy situation but "à la carte" refereeing doesn't exist". The chair umpire at the centre of the saga has spoken publicly for the first time since the match, saying he is "fine". "Do not worry about me!" Ramos has been assigned to officiate the Davis Cup semi-final matches between the United States and Croatia, a best-of-five series which begins Friday and ends Sunday in Zadar, Croatia.